Are you trying to cut costs? Having Christmas presents to buy does not help with the already strained budget. What do you get everyone that does not cost a lot of money? What about a partially handmade (the decoration part is the handmade part) gift. My inspiration came from a Pin from Jodee Kulp on Pinterest, she posted about oven mitts that had been decorated by kids for relatives. Now that is a different gift that a relative would love and a cheap gift. Now what is needed to do this craft exercise? I used oven mitts and pot holders as they came in a set, I got them for $3 each, so that was lucky. Make sure to pre-wash whatever you are using as they might shrink and you would not want your work of art to be ruined after a wash.
Apron for the kids. Kids in clothes that f it gets dirty it does not matter/or if it is hot enough they can just have the apron on and that will save on the washing. The bottle says fabric paint washes out with water, but I would be careful. Make sure to put a cover on the floor as I kept on putting my foot into paint the kids kept on spilling. Not good as I wondered why there was paint in the kitchen but it was due to me walking it there. Newspaper/paper to line the table so you just need to chuck out the paper and not scrub the table. After paint has dried from the oven mitts and pot holders you just need to iron it or add heat so that it sets to the fabric paint. I would advise to put a tea towel over the creation and then iron. After this is done according to the paint instructions it should be good to be washed but wash with like colours. One tip: Due to the material being raised and not flat, the hand prints did not come out as I imagined. Make sure to get material that is flat all over so to ensure a better hand print outcome. 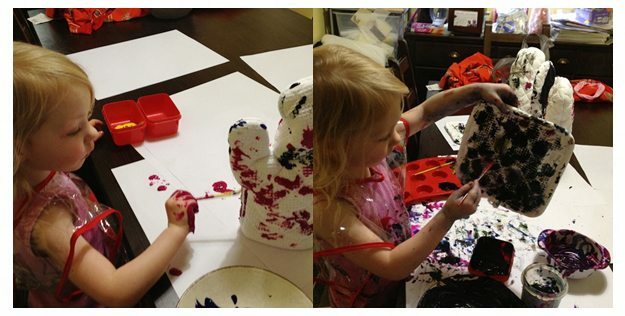 The twins got messy and just had a great time with this activity. Just be careful when kids help create presents for Christmas , they cannot keep a secret. My girls were telling Nana (my mum) that they were making presents for her and describing what it was. I then explained it is a secret and then both girls realised. Maybe you need to have the talk before you start the project that it is a secret and no one can tell until the present gets opened on Christmas day. How about try tea towels or t-shirts. 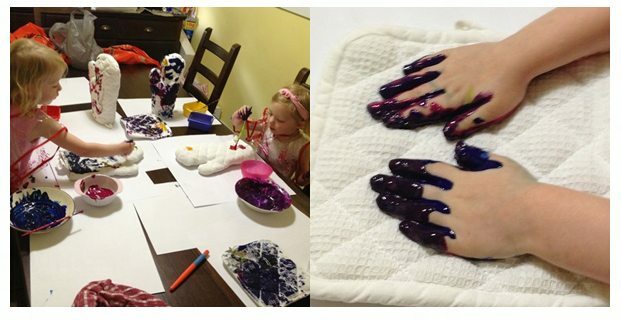 Why not try this using fabric crayons you can have a drawing by one of the kids put on a t-shirt or tea towel. I came across them when doing this post, have not found them but when I do will try them with the kids. 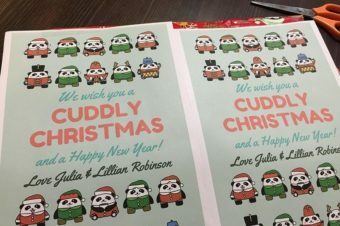 Do you make gifts for Christmas? If so what have you made? Do the kids help you? If the kids have helped, have they shared the secret before the present was given? Send in your comments.